This morning before work, I joined our pastor and another parishioner from Hope Central Church to offer the imposition of ashes at our local subway station. It is an awkward thing to stand on a street corner in Boston. I blessed two bicycles and a sick dog. Don asked for prayers for his sobriety as he walked to yet another AA meeting. Dulcie, Gloria, and Juanita all asked for ashes on their foreheads. I stood for a photo taken by a commuter who said “this is great. Thank you for being here.” Dry ashes stick to the oily foreheads of teenagers on their way to English High School. Dry ashes mound in the wrinkled skin of old men who can only afford the free newspaper. 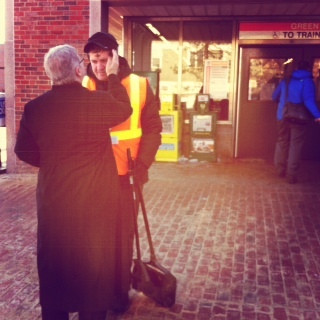 But before the commuters, we blessed the subway station cleaning crew. There’s been a lot of discussion about whether or not Ashes to Go is savvy “liturgical evangelism’ or cheap grace. I too would prefer the luxury for all of us together to sit for an hour in community to hear the full readings and participate in a full liturgy. But for some, the time and freedom to be in a church for an hour is in fact a luxury. Ashes to Go not about convenience, but about outreach to those who will not or cannot walk through the doors of our churches. What we offered was not for those of us inside the Church already, but for those without a spiritual home.Yes, our prayers with commuters, subway employees and the subcontracted cleaning crew may have been quick and dirty compared to the beautiful liturgies of Ash Wednesday, but so are we. We are dirty. Lent is dirty. And so is the man who cleans from the subway station the garbage that all the rest of us mindlessly leave behind. The least the Church can do for him is show up in his space rather than presume that he always enter our space. While the wages of those who clean up after us may be unjustly low, their lives and work are hardly cheap.